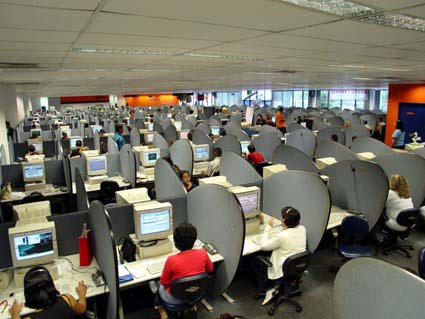 Have you ever thought how the look and feel of your delivery center affects your call center agents? Well if you haven’t, then let it be known that it does have a strong effect on them and could greatly enhance or diminish their morale and performance. Here are a few ways by which you can brighten up your call center and make it a better place to work at. Communal Areas: It is advised that you create a few communal areas for your employees. This could be a big step towards encouraging employees for collaboration. Employees from different departments will get to interact with each other at such places. This will create a happy environment at your call center where employees would know each other and interact irrespective of their departments. Such an initiative could easily develop a good feeling and sense of security in your employees. Let Your Employees Suggest The Colours: Another great thing would be to allow your employees to give suggestions for the colour of the walls. It is a good practice to invite them for participation in such activities. Apart from getting some really great ideas for your office looks you will also develop a sense of personalization in the mind of your employees. Develop Creative Meeting Rooms: You should never ignore your meeting rooms while renovating your call center. Moreover, it is advised that you be a little extra creative while developing your meeting rooms. This would be the place where your staff would hold important meetings. Further, your visitors, clients etc would also be visiting this place. Therefore it is suggested that you try to make this place a little brighter and lively. Make it a place where people would feel comfortable in interacting with each other. Have Interactive Wall Spaces: You should also have a few walls that would have a whiteboard on which employees could write whatever they want. This could be a great way of making employees express themselves more openly. The employee engagement would definitely see a huge rise. These were some of the things that you must keep in your mind while renovating your call center.